As Chinese investments in the United States surge, Senator John Cornyn discusses the challenge facing the Committee on Foreign Investment in the United States (CFIUS) and previews reform legislation to require heightened scrutiny and vetting of foreign investment transactions for national security risks, particularly Chinese technology deals. LEHR: Good afternoon. I’m Deborah Lehr with the Paulson Institute, and welcome to the Council on Foreign Relations. We’re very pleased to be hosting Senator Cornyn today to talk about how foreign investment is not undermining national security, or at least what he is doing to prevent that. The senator from Texas, as you know, is the Senate majority whip. He is on the Senate Select Committee for Intelligence, on the Senate Finance Committee, and on the Senate Subcommittee on International Trade. But, as I found out looking at our background, the two of us also share something that probably is unique to this room: In addition to being the children of Air Force pilots and having lived all around the world, we also ended up from these world travels in San Antonio, Texas, and graduated from Trinity University. CORNYN: Well, thank you, Deborah. And it’s good to be here with all of you. Thanks for the opportunity to come share a few thoughts about national security and our defense industrial base, which are the focus of my remarks. I’m honored to be here with Deborah, who I know is an expert on Asia and China. You’ll hear a little bit about China today, not just because this is focused on China, but China seems to be the most aggressive country in raising the concerns that I want to talk a little bit about. The legislation that we are working on, and we would invite your feedback on, modernizes the Committee on Foreign Investment in the United States—the CFIUS process—which you know operates under the auspices of the Department of Treasury and Secretary Mnuchin now. Thanks to the Council on Foreign Relations for having me today and all of the members who are in attendance. I am not an expert in most things. By nature, legislators are generalists. But certainly as a result of my experience on the Senate Intelligence Committee, my service on the Senate Finance Committee, and on Judiciary Committee, the more I began to look at the way that China, as the preeminent and most aggressive county, was acting tactically in ways to avoid the CFIUS process as it currently exists, the question was raised: What do we need to do to modernize it, and to deal with the current realities and tactics in terms of how countries can operate in a way that threatens our national security and threatens our industrial base? So what’s happening in the U.S.-China relationship in particular had spurred some ideas for reform. First of all, it’s likely obvious for many of you that China is using every tool at its disposal to close the technology gap between the United States and that country, and in the process to eliminate our military’s tactical advantage that we have enjoyed for so long. If I think about one thing that really—beyond the great men and women who serve in our United States military—that distinguish ours from the rest of the world, it’s our technological edge. And something that China covets, and something they want to erode. China is not only a country of unprecedented size, it’s one with unprecedented industrial policies as well. China, as you know, is implementing Made in China 2025, a 10-year roadmap that aims to transform it into a leader of advanced manufacturing. This roadmap broadly targets 10 strategic sectors, including next-gen information technology, aviation, rail, and new energy vehicles, giving preferential treatment to Chinese companies. Left unchecked, I believe that China’s investments have the potential to degrade our nation’s military superiority and to undermine our U.S. defense industrial base, including significant damage to our long-term national security and other longstanding effects. Most of what China wants to invest in these days is leading-edge U.S. technology that’s a key to our future military capabilities. Unless the trend line changes, we may be—we may one day see some of these technologies incorporated in China-made equipment that can be used against our own—our country in the event, heaven forbid, of a military conflict. So we need to do everything we can possible to prevent such an outcome. But China’s actions in recent years provide reason to question its ultimate intentions. But what doesn’t get much attention is something much quieter, in my view equally insidious and problematic, and that is China’s steady investment in American technology companies, many with dual-use military and civilian applications. This is a problem our Department of Defense has identified: Beijing encouraging or even helping to finance Chinese companies to acquire or invest in American technology companies in places like Silicon Valley or in what we call the Silicon Hills in Austin, Texas. Why? Well, that’s part of China’s long-term strategy, to leap-frog ahead of us by investing as much in U.S. technology as possible, leading to the degradation and eventual loss of our country’s military technological edge. In doing so, China’s figured out that it can really weaponize investment, so to speak, and use it to exploit our open U.S. economic system. It’s been reported that the Chinese government has already made major investments in technologies like robotics, a myriad of sensor technologies, and even artificial intelligence. According to The New York Times, in a span of six years beginning in 2010, Chinese investors poured about $30 billion into early stage U.S. technologies, and now make up as much as 10 percent of all venture deals. Now imagine the boost for China’s overall military capabilities, not just tomorrow but 10 or 20 years from now, once some of those technologies are in full production and integrated into Chinese weapons systems. China and other adversaries know the United States military will know the vulnerability of our supply chain, which rely, of course, on the private sector. As I said, CFIUS was created not with China in mind—I think we’ve talked a little bit about the Dubai ports issue and other issues other countries have presented at different times in our history—but, again, now we are focused on the most aggressive country in terms of gaining that technology edge or closing that technology advantage we have—China. But, of course, CFIUS was designed to guard against this specific type of threat, but we have to plug the gaps in CFIUS for the sake of our national security, and we’ve got to work with our allies and partners to put them in a place—to put in place similar safeguards. So I’m not here to argue that the CFIUS process is dysfunctional or entirely broken. On the contrary, I believe it’s working reasonably well in most instances. CFIUS has simply fallen out of date and needs to be modernized. It wasn’t designed to handle the investment-driven transfer of leading-edge technology that China is vigorously pursuing today. The current structure to protect our most sensitive industries just doesn’t do the job anymore. Our military leaders and intelligence community agree with this notion, and have a shared sense across the national security apparatus of the urgent need to update CFIUS. As you heard, I have the honor of serving on the Senate Select Committee on Intelligence, and just a few weeks ago during our worldwide threat hearing, the director of national intelligence, Dan Coats, the CIA director, Pompeo, and the NSA director, Rogers all echoed the same concerns about the CFIUS process as it currently stands, and they said it doesn’t appropriately look to the whole range of investment decisions made by other countries into key technology companies. Similarly, the Senate Armed Services Committee last week had Secretary Mattis testifying, and he said that CFIUS, in his words, is outdated and quote “needs to be updated to deal with today’s situation.” The chairman of the Joint Chiefs of Staff, General Joe Dunford, echoed his strong agreement. I want to be clear here and say what this is not, which is this is not an attack on foreign investment in the United States. It’s not an attack on free trade. I am a free trader. I believe strongly that it improves our economy by creating markets for our goods and services around the world. And I certainly don’t believe we ought to go down the path of increased economic protectionism as some have argued. My home state of Texas is a beacon of free trade. We are the largest exporting state in the nation, and we reap enormous benefits from that and from foreign investment in the United States. But because of—and I want to say, I am a strong supporter of foreign investment as well, including even investment from nations that aren’t necessarily our friends or allies. It can be beneficial to us on the right—under the right conditions. But in the case of China, not only are they stealing and copying our technology to modernize its arsenal and erode our military superiority, they’re strategically investing in key sectors of the U.S. economy. So they’ve managed to exploit the status quo that we have in place. And so, again, the system needs to be updated. The Defense Department has done a study under Secretary Carter, recently reporting that—it’s an unclassified study, but I understand not widely available. But they’re concerned particularly about venture capital deals involving companies with early stage technologies. And documents—this report documents a number of CFIUS gaps. It found specifically that China is aggressively investing in critical future technologies that will be foundational for future innovations across technology for both commercial and military applications. The Department of Defense concluded that the U.S. lacks a holistic view of how fast this technology transfer is occurring, the level of Chinese investment, or what technologies we should be protecting. And they noted that CFIUS, in the view of the Department of Defense, was only partially effective, and that problematic investments occurred outside of its jurisdiction. As many of you know, I soon plan to introduce a bill to try to address some of these issues, a bipartisan piece of legislation—which is very important if you actually want to pass anything in the United States Congress. But we call it simply the Foreign Investment Risk Review Modernization Act, or FIRRMA for short, which will modernize the CFIUS process to prepare our country to meet the 21st-century threats. This is a reform bill that’s focused in a laser-like way on national security interests. It’s a measured approach. It doesn’t seek to rewrite the system as we know it, but instead seeks to plug the gaps and put in place some statutory guardrails where they’re desperately needed. First, I would ensure that we focus on nations that are the biggest threats. As I indicated earlier, no nation is actually mentioned by name in the legislation, but we know who the most aggressive countries are at this point. But it could well not be China. It could well be Russia. It could be some other countries. But it does institute a process where we will identify those nations that represent the biggest threats. And it’s based on—strictly on national security criteria. We already do that, for example, in our export control system. By ensuring the federal government mostly closely scrutinizes investment from those countries that pose the greatest risk, FIRRMA will help those protecting our technologies prioritize appropriately and set a clearer standard for how those investments should be evaluated. Secondly, it would give CFIUS more authority to look at investment deals that, as of today, don’t fall under its purview, such as joint ventures based overseas and minority position investments in companies, which literally give companies investing the keys to—the keys to the door, and all the intellectual property and all the data that they own. We all know that technology’s advancing rapidly—too rapidly for Congress really to keep up. And that’s why our export control regime doesn’t really work very well in this space. So that’s why we intend to plug the gap with this bill. This legislation would give CFIUS the means to assess technologies that the export control regime has not yet figured out what to do with. The bottom line is this: We’ll try to enable CFIUS to take a tougher line against certain investments emanating from those nations that pose a clear threat to our national security, focused particularly in the area of advanced technology. And just as important, this is what my legislation will not do. It will not add new members to the CFIUS. It will not duplicate our export control system. We will not ban foreign investment in the United States, including investment from China. It will not itself designate specific countries, as I said, for higher scrutiny, or specific technologies to be protected, instead leaving that to the executive branch. And it will not require CFIUS to consider investment reciprocity or economic security in its analysis. There are some members of Congress who are talking about a bill that I fear, if taken out of the focus of national security, will be basically economic protectionism. And I don’t think we should head down that path, personally. So we’re putting the final touches on the text. And I’m optimistic that it will enjoy bipartisan support. We’ve been in consultation with the Treasury Department, and Secretary Mnuchin in particular, and are working closely with his office to try to make sure we get this done right. But as you know, any piece of legislation, even after it’s introduced, is subject to modification, and we would continue to solicit your input and the input of others who have an interest in this particular topic. My overarching concern is safeguarding our national security and specifically preserving U.S. military superiority for the future. With that as our goal, the status quo on investment from China is simply unsustainable. LEHR: Delighted. So you talk a lot about, obviously, how we need to be much more concerned about investment coming from a variety of different countries coming into the country, although the United States traditionally has been the beacon for openness for investment, for free and fair trade. How do we balance the benefits that we have received from having this open investment environment to our concerns on national security? CORNYN: Well, Deborah, I agree we should continue to be that type of country because I think that benefits all of us. And that’s why we tried to be very narrow in terms of our focus on national security, but not just buying or stealing our technology and then using it against it, but also looking at the tactics that are used that are now outside the scope of any sort of executive branch review process, specifically, as I mentioned earlier, joint ventures, minority investment. We tended to look at control as sort of the essence of our triggering a review, but I think we all can agree there are things short of outright control of a business that give access to technologies that we’d prefer our adversaries not to have. And this just presents a means by which those investments are evaluated on a voluntary basis, I must say. We’re not even making this mandatory. Now, the consequences of crossing a line you should not cross, the secretary and the U.S. government has the chance to unwind the investment. And I understand some of the concerns in the business community that we strike exactly the right balance. So we’re trying to be very focused. We’re not trying to be overbroad, and we’re not try to do anything which will dampen either foreign investment or trade with the United States. LEHR: —and that they have a very systemic plan. But CFIUS in its nature tends to be very transactional, that it is one deal at a time as opposed to looking at what the overall picture looks like. LEHR: So how do you envision that the bill will help bring this more systemic approach to the CFIUS process? CORNYN: Well, I agree that China is using an all-of-government approach, but we need to remember that China is basically—everything in China happens under the auspices of the communist party. And it is not a democratic country that respects the rule of law, and so many times they make demands on foreign investors in China in terms of opening up the business or data or financial information as a prerequisite to doing business there. So this does deal with the very narrow transactional approach, as you point out. I don’t mean to suggest there aren’t other things we should do, particularly on the cyberspace where we know that China is very aggressive. And, of course, it’s always cheaper and faster to steal intellectual property than it is to go through the research and development process and the lengthy procurement and acquisition process we have here in the United States. And that gives them an ability to do things a lot faster and basically gives them an advantage that we want to try to slow down or thwart. LEHR: OK. So you mentioned also that there’s a lot of discussion in Washington about how to bring greater reciprocity into our trading relationship with China. And certainly, since China’s WTO accession, we haven’t seen a major trade agreement with China in those years. And over the past 10 years, there really hasn’t been significant market opening. And so how do you see beyond CFIUS and beyond their role in terms of investing in our country? What do you think the administration should be considering as it looks at its overall trade policy with China and how to bring greater balance to the relationship? CORNYN: Well, I remember we—when the Senate passed Trade Promotion Authority, it had some controversy associated with it on both sides of the political aisle. We ultimately passed it with 47 Republicans and 13 Democrats, so it’s a fragile issue. Trade has become, obviously, the target for a lot of political rhetoric that I think in many ways it doesn’t deserve. Globalization, automation, and other things that challenge our economy and jobs here at home I think a lot of times get—the blame gets pointed at trade when it’s not really deserved. But I—as I indicated earlier, I think free, fair trade is good for all of us. I’m a supporter of the Trans-Pacific Partnership. It was made clear to me by Secretary Ross that the administration didn’t like multinational trade agreements because they felt like we gave up too much and we weren’t—they weren’t effectively enforced, and they prefer bilateral trade agreements. I’m not yet sure exactly how that’s going to work. Ambassador Lighthizer, the U.S. trade representative, was in front of the Finance Committee yesterday, and we had the chance to ask him a little bit about NAFTA, which is important to the United States—5 million jobs results of trade with Mexico, 8 million jobs as a result of trade with Canada. It’s been, on net, I think a huge economic boon to the country. But, as you know, that’s going to be subject to renegotiation and modernization under this administration. But what they—what Secretary Ross has told me, they want to pursue a bilateral trade approach. I’m not sure exactly how that will work and how they will prioritize those. But I would hope that, as we continue to discuss things that we do have in common with China, recognizing we have clear areas where—that we are not in common, where are in conflict, that we look to them to open their markets on a reciprocal basis in the same manner we have. I’m not optimistic, given the nature of their government and the fact the Communist Party runs the country, and clearly they seek to use their economic advantage to extort concessions by people who want to do business there. But certainly that should be our goal, to try to gain some level of reciprocal treatment when it comes to trade. CORNYN: To weigh in. Yes, we will. LEHR: —to weigh in. Yes. So you also were talking about the fact that China is using its economic might to get concessions, but not only from our companies who are doing business over there, but last month or earlier this month we saw President Xi hosted the One Belt One Road initiative. And he had essentially 29 heads of state and over 200 ministers coming to China to essentially ask for these economic concessions, and he’s using this as a major economic but foreign policy initiative, and in many ways what they’re doing is using construction financing or infrastructure financing. And as you consider—you were talking about CFIUS and being able to consider joint ventures overseas, is that in reaction to what you see as a very aggressive policy on behalf of the Chinese to use their economic might for influence in its foreign policy? CORNYN: That wasn’t specifically what motivated our legislation, because we were trying to stay focused on industrial base here in the United States and national security. But clearly, China is an economic powerhouse, and they are a very big country, and they are very aggressive in pursuit of their policy goals. I think the administration is smart to try to figure out if we can work with China in some areas, like dealing with one of the preeminent threats of our time, which is North Korea. And I hope we’re able to get some help, based on shared interest there. But I think they are clearly economic rivals of the United States. They’d love to have what we have in terms of a big economy. They have a public safety and a national security requirement to keep people busy and at work rather than restless and unemployed, and so that’s why they are so aggressive about trying to continue to grow their economy at a very high rate to deal with domestic security concerns. So I think it’s not surprising to see them use every tool in the toolbox to advance their national interest. It’s hard to blame them for that. But I think we need to go into this with our eyes open about what’s in the national interest of the United States, where we—what we share in common, and what—where we clearly are experiencing some friction or outright opposition. LEHR: Great. So, as you sit on a variety of different committees, you get insight into many different issues. So what is the one challenge that really keeps you up at night—that is, the one challenge facing the U.S.? CORNYN: Well, I mentioned—it depends, you know, where you go. It’s interesting, you go over to the Pacific Command, to Admiral Harris out in Hawaii, you ask him, what keeps you up at night, and he says, North Korea. You ask General Dunford, the chairman of the Joint Chiefs of Staff, what the preeminent national security threat is to the United States, and he says Russia. I think in some ways, we have not focused on those challenges as much as we should have. And of course, we’ve been fixated, appropriately, on terrorism. But in terms of existential threats to the United States, I don’t think terrorism poses an existential threat. It’s a serious threat. We need to attack it with everything we have. But I think that we’ve sort of taken our eye off the ball somewhat in our relationship with Russia and China, to some extent. If you’ll allow me to add, I remember having a conversation with a chief executive of a large multinational company that actually did business in Russia during the Russian sanctions debate a few years ago. And he told me—he said he’d had a lot of interaction with Vladimir Putin throughout his career. And he said: There’s two things that Putin understands. One is strength, the other is weakness. And weakness, he suggested, was an invitation or even a provocation that invited them to be more aggressive than they have been. And so I’m glad to see the new administration taking some steps to deal more firmly with our rivals around the world. I think that ultimately will keep us safer and render the world a little bit more peaceful place, because unfortunately weakness does invite—does invite the bullies and tyrants and dictators around the world to do things that are disruptive and lead to—can lead to armed conflict. So we’re going to ask members now if you have any questions. I want to remind everyone, this is on the record, and to please limit your remarks to one question and very briefly, so we can fit in as many since there are a lot of questions. And wait until the mic gets to you. Shall we start right in front? Q: Thank you. I’m Priscilla Clapp. Retired Foreign Service, but I’m at the U.S. Institute of Peace. CORNYN: That’s not within the scope of what we’re trying to do here. And I would suggest that that is a subject better left to trade negotiations. And I think there’s a lot of work to do. Q: OK. But I mean, what—is it a channel for technology to be passed to China? CORNYN: Well, this is—yeah, we’re primarily concerned about investments from nation-states and technology using methods that are currently not reviewed by the executive branch because CFIUS doesn’t include minority investments or joint ventures, for example. And we’re seeing nations use those investment vehicles in order to gain access to intellectual property and technology that has dual use or otherwise gives us a comparative advantage. The question is, there are two regimes, as I understand it: The export control regime, which prohibits the export and providing of certain technologies to foreigners, right, and the CFIUS regime, which has to do with investment in the United States. Could this—could your new proposal work such that a minority investment in a company would be prohibited, even though the export of technology from that company would be allowed? CORNYN: Well, I think the CFIUS review process, once we give them jurisdiction in order to look at all of that, they can enter into negotiations which will allow mitigation agreements and other means that would actually allow the investment to go forward, but which would minimize the national security concerns. So certainly, as I said earlier, I’m not interested in creating an impediment to foreign investment in the United States because I think on balance it’s a good thing. But specifically in the national security space, I think we need the review process and need CFIUS to be able to take a look at, is this not a national security threat, is this not a threat to our industrial base? And if there are concerns, to be able to enter into negotiations to allow the transaction to go forward, but with a mitigation agreement in the process. LEHR: Right here in the center. Q: John Bellinger, Arnold & Porter Kaye Scholer and an adjunct fellow in national security law here at the Council on Foreign Relations. So you’ve talked about broadening the scope of CFIUS so that it covers things that are not currently covered. And I think a lot of people have some concerns that there are some gaps in that area. But are you also concerned that CFIUS is approving things that you think it should not be approving right now? Do you disagree with the approvals of certain Chinese investments? And other than essentially expressing concern about certain unnamed countries, how would your bill address that? CORNYN: Well, I would say we’re trying to remain agnostic in terms of individual transactions and just trying to bring more transactions under the umbrella or within the jurisdiction of CFIUS so we can catch problematic transactions when they do arise. I know we all read in the newspaper on a regular basis or are aware of investments by other countries in the United States. We were talking about the Dubai Ports investment in the United States as being one of the reasons that CFIUS was actually, you know, in the news at the time. So it’s not just one country, it could be any number of countries at different times. So we’re not specifically trying to go back and say we think CFIUS did a bad job on approving this transaction. We’re remaining agnostic about that, at least insofar as this legislation is concerned. What we’re trying to do is look prospectively at ways we can fill the gaps and avoid things that should be reviewed unintentionally slipping through our fingers because we simply have not updated the legislation in a way to cover things that are now being exploited by other countries. I wonder, a three-part question. Your proposal gives a lot of room to the executive branch to make decisions. Have you discussed this personally with the president and the executive branch? How would you characterize their interest? Have you discussed this with Silicon Valley representatives or the artificial intelligence research community, and how would you characterize their response? And third, the white paper that you bring up from the Pentagon, also called the DIUx paper, is non-classified. Can you make it available to the public? Thank you. CORNYN: Well, I don’t have custody of it, so I guess we’ll have to take that up with the Department of Defense. But you’re right, it’s not classified, but I know it’s not generally available. We have tried to solicit input from the technology companies, understanding that they’re no doubt a little skeptical going into this, at anything that might impair their ability to freely accept foreign investment in their business or their business arrangements, whether they be joint ventures or other means, because obviously, their priority is not necessarily national security. I don’t say that to disparage them at all, I just say they’re businesses interested in doing what their shareholders approve of and remaining solvent, if not profitable. So that’s uniquely, I think, the concern of the federal government and our responsibility here. As far as the executive branch, I’ve not talked to the president. I’ve talked to Secretary Mnuchin on a number of occasions. And they are—while I can’t announce here today that they, you know, 100 percent approve of what we’re doing, I can tell you he is supportive of our efforts. And, of course, we are here just at the beginning of this process. But after we saw what the Defense Department under Secretary Carter came up with in terms of identifying the gaps, in light of what Secretary Mattis, the current secretary of defense, has said about his concerns and all of the intelligence community from the NSA, the CIA to the DNI expressing their concerns, it seems to me that that’s a good enough reason to do what we’re trying to do. But one reason I wanted to accept the kind invitation to be here today is to get—broaden our appeal for input and collaboration so that we get this done right, and to also dispel any suspicions that we were doing something we weren’t trying to do. Q: Hi. Miriam Sapiro from Finsbury, formerly—well, in my last government role at USTR, I had the distinct pleasure—I’ll call it a pleasure—of serving on the CFIUS committee and spending many hours on some of these challenges. My question, in a way, follows on John’s. CFIUS actually gives the government very broad authorities. I think some of the issues you’ve touched on—I very much applaud your efforts to try to get a much better sense of, you know, where China’s going and what we can do about it. You know, the theft of intellectual property is a serious problem. Greenfield investment is something that’s very hard for CFIUS to regulate. As Deborah said, transactional issues are the way CFIUS focuses. I think now, though, there is more of a sense to look at patterns; at least when I was there, that was starting. But I think, with this new approach, I do applaud you for doing it, but I do think, like you said, we need to broaden the discussion because it’s going to be important to look at cases, even if it’s quiet, to figure out whether greater authority would have led to a different result. And I say that because there is no real minimum threshold for CFIUS, so it can look into a lot already. While there’s no list of countries of concern, there are countries—I mean, every transaction is scrutinized, but there are certain countries that get intense scrutiny. So I think the relevant question might be, what’s—you know, in a concrete way, what’s not working? So that if we do open up CFIUS—it hasn’t been opened, you know, that often—we can do it in a way that really does address the kinds of concerns that you’ve so eloquently outlined. CORNYN: Well, given your experience, we’d value your continued input into the discussion. But really, there’s two things that stand out. One is a strategy by China to aggressively exploit the gaps that we have now so that they—these transactions don’t even get considered by CFIUS. And then the concerns expressed by the intelligence community and our national security community that this will undermine, potentially, our defense industrial base, and it’ll also negate our technological superiority over our potential adversaries. And so that really is very specific. We also have a provision in here that deals with real estate transactions. Imagine foreign countries buying real estate next door to some of our most sensitive national security bases, and the opportunities there would be for espionage and the like. So our focus—we’re trying to stay focused very narrowly to fill those gaps and to address this comprehensive strategy that I don’t think we can afford to ignore. LEHR: Great. You on this side. Q: Patricia Wu, C&M International. Thank you, Senator. You hadn’t mentioned yourself that there are some who have discussed broadening CFIUS to look at issues such as economic security and reciprocity. And I’m curious. I appreciate your points about keeping a narrow focus, but for those who are interested in going down that path, how would you respond in terms of your rationale for keeping it narrow? CORNYN: Well, my experience in the Senate with comprehensive bills that cover a multitude of issues is not good. We don’t do comprehensive very well. And so my focus has tried to be getting something actually done, and keeping it focused on the current role of CFIUS and not expanding it to deal with economic issues. Honestly, one of my concerns about getting outside of the national security space is that CFIUS will be used in a sort of protectionist way, or (for ?) a country that will basically negate the benefits of free trade and foreign investment in the United States. And I want to make sure we don’t sort of head down that path. Having said that, I recognize to get things done in the Senate it has to be bipartisan, and you need at least 60 votes. So I can’t guarantee you somebody won’t offer an amendment or some other suggestion, either in committee or on the floor, to do exactly that. But that’s my rationale for keeping it focused right now. Q: Oh, thank you. Chris Wall from Pillsbury Winthrop. For those of us who have been involved in the CFIUS world for a long time, two of the sort of pole stars in the debate have always been narrowly defined national security on the one hand, and at the other side not restricting foreign investment, which I take it from your description of the draft legislation you have those goals very much in mind. But we understand too that national security has been updated since it was originally passed in 1988, the Exon-Florio Amendment. Can you provide a little more specificity in terms of the types of technologies that we currently are addressing now that would be within the broad rubric of national security? I mean, you’ve mentioned advanced technologies, sensitive, new stage, early stage technologies. Some clarity to the investment community as to what kinds of technologies might be encompassed and how those would be defined. And on the other hand, so not as to deter foreign investment, the kinds of transactions that would not be subject to CFIUS. For example, green field is currently not subject to CFIUS. Certain real estate transactions, movie theaters, that sort of thing. Any clarity on either side of those two poles would be very interesting and helpful. CORNYN: Well, we—in regard to your question about green field investments, we really don’t touch that, which is established businesses. And that is the focus of our concern. I think we ought to keep an eye on other things that people might migrate to, to take advantage of some other gap in the future, but that’s not our intention right now. I can’t really give you specific—too many specifics, other than I can tell you some of the concerns that I, myself, have read and have had brought to my attention, things about using technology that’s used in U.S. weapons systems, from rockets to sensor technology. The concerns about autonomous vehicles that are being used not only by—in the private sector, but also have application in the military space. And things like that. So I guess what we’re trying to do is establish a process more than anything else. We’re not trying to stamp any particular transaction or any particular technology as either favored or un-favored. We’re trying to create a process that allows the experts and the smart people with all the information an ability to weigh in and figure that out. LEHR: And I think the technologies that you raised, though, very clearly fall kind of within this national security space. And I think Miriam was being very subtle when she was talking about the inherent tensions between the national security side and the economic side. And I think one of the big examples of that was the Smithfield acquisition, and how CFIUS has the flexibility to even look at a pork processing plant. And how do you find the right balance in terms of, if you’re going the expand the authorities and the industries that they look at, how you are able to still maintain some of that—(inaudible)—going too far on the economic side? CORNYN: Well, yeah, these are—these are pretty commonplace discussions we’re having today. Just witness after the San Bernardino shooting the debate over law enforcement and Apple, over their encryption of their—of their cellphones. So trying to find what the balance, the right sweet spot, is just part of the ongoing conversation. Q: Lloyd Hand, King & Spalding. I have a two-part question. This may have been asked differently. And the first part is that, and in respect to the specific changes, do you contemplate tightening or changing the current authority to create a board to protect currently where you have foreign investment, to shield that foreign investment from sensitive technologies in that company? The second part is, are you relying much on the business community to support this effort? I commend this basis, particularly on a bipartisan basis. But earlier efforts to address some of the economic security questions in the Congress failed because so many U.S. companies who have investments in China are very reluctant to support any legislation that appears—even has the appearance of being anti-Chinese, because of the threats of retaliation. CORNYN: Well, Lloyd, I would say I still believe in facts. And then there’s spin. And one of the reasons I wanted to come here today is state the facts of what we’re trying to do. I understand there’s a lot of people suspicious of—and maybe in the business community—thinking that our real goal is to somehow prohibit foreign investment in the United States or somehow stigmatize our interactions with China. I’m not trying—I don’t want to do any of that. And I know you weren’t suggesting that. It’s just that I think if people don’t know what the facts are or what the objective is, it’s easy for them to believe the worst. And hopefully we can have a constructive engagement. With the business community, my experience is you really don’t get a lot done with the business community’s opposition. So we’ve very much tried to engage, to listen, and to shape the legislation and to, in response to the suggestions or criticisms that have been raised, that’s another reason why we’ve tried to keep it extraordinarily narrow. And to your first question, not really change the CFIUS process itself, but really deal more with its jurisdiction, the sorts of transactions now are without—outside of its purview. So I’m sure as part of the legislative process that we’ll get continued input from people all around the country, and that’s a good thing. It’ll help us do a better job. And there will be some give-and-take, as there always is in the legislative process politically, different people with different interests. But this is—this is where we’d like to start. LEHR: OK. In the back. Q: Len Bracken, Bloomberg BNA. Can you give us an idea of when you intend to introduce the legislation and any cosponsors you might have? And with regard to minority ownership, would that include equity shares? And do you have an idea of any thresholds you’re considering? 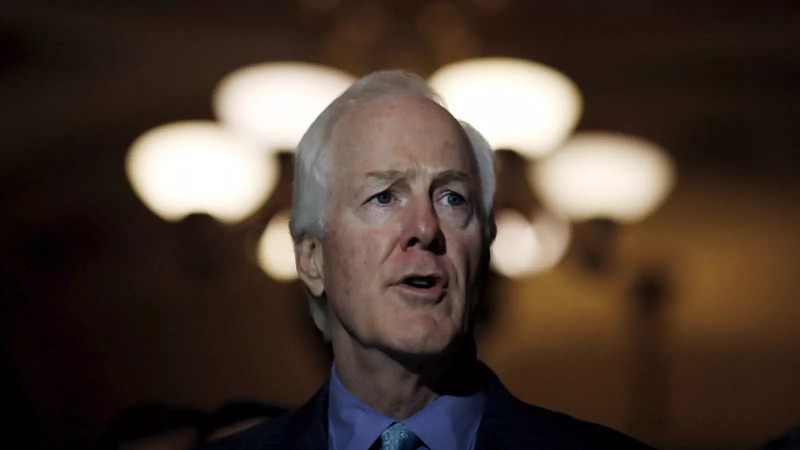 CORNYN: Well, with regard to minority ownership, what I’d like to do is leave that determination—the concern mainly is acquisition of things like intellectual property and so forth that can come along with the investment. So if it’s some sort of passive investment, I don’t think we’re really—I’m not particularly concerned about that, but where it does open up a company to acquisition of their intellectual property or data that they use in a way that undermines either our competitiveness or our defense industrial base or it affects national security. Right now, Senator Gary Peters is one of my cosponsors. I’m working closely with other senators, and hopefully we’ll have a broader announcement. But we’ve tried to do a lot of homework here before we go primetime, so we’ll continue to roll this thing out. And I expect there will be broad bipartisan support by the time we’re done just given the generalized awareness of the problem and the need to act. Q: Hi. Stephanie Handler, Hogan Lovells. In talking about the broadening of the scope of CFIUS, this mandate to review transactions, I wonder if there’s also consideration of broadening the scope of mechanisms for mitigation, because we obviously see transactions that have CFIUS must state at the end of a case that there are no unresolved national security concerns. And then you can have mitigation be approved and those tools, though, seem to be limited in many instances. And as we’re considering broadening the scope of CFIUS to include other transactions that may not have been traditionally considered to have national security concerns, is there an exploration of possible mitigation proposals to allow those transactions to ultimately make it through with no unresolved national security concerns? CORNYN: Well, I’m certainly open to that conversation. My assumption is we wouldn’t do anything to bind CFIUS from coming up with what they considered to be or negotiate an appropriate mitigation provision that satisfied their national security concerns. So we’re really not interested in tying their hands or limiting that in any way and certainly open to any suggestions you or others might have about improvements in that area. Q: John Hauge, Global LPG Partnership. Apparently, one of the reasons the administration did not label China a currency manipulator was it sought its help to deal with North Korea. Are you worried, even if your bill passes, that certain administrative geopolitical goals will be given much greater priority? CORNYN: Well, as I suggested earlier, our relationship with China is one in which we share some common interests, but also clearly are rivals economically. And it’s a rising national security challenge to the United States as a result of investment and modernization of their weapons, the aggressive actions they’re taking in the South China Sea, for example. And so my assumption is that we’re going to continue down that path where we’ll have areas we agree and where we disagree. One of the reasons why I’m trying to make clear the narrow focus and the purpose of this is not to allow this to be characterized as somehow disparaging foreign investment or one country. It just happens to be that they are the ones that are most aggressive in this space now. It could be another country at some other time. And particularly given their cyber capabilities and their aggressiveness in that space where we’ve seen stealing of intellectual property and design plans for U.S. weapon systems, it’s a particular concern. But my hope is that we’ll work our way through there, find areas we can work on hopefully, like North Korea, while we disagree about other things, like the South China Sea. Q: Hi. Jonathan Wakely from Covington & Burling. I think many of us in the room who have practiced before the committee are aware of the resource constraints that the committee and many of its member agencies have in terms of money and personnel. And I think we all understand that some of the things you’re trying to do could increase the committee’s workload. Do you have any ideas or plans for how to address that issue to ensure the committee and its member agencies have the resources that they need to address these issues? CORNYN: Well, you certainly have the advantage on me, because I’ve never practiced in front of CFIUS. So I really would have to defer to the committee and the secretary and those of you who have practiced there in terms of what impact this would have on their workload and the need for additional resources. But I think, clearly, we don’t only need to provide them additional authorities; we need to provide them with the resources they need actually to get it done. So that would be my goal. Q: Thank you, Senator, for the talk today. I was wondering, are you anticipating any provision in the dual use regulation of national security export controls that would tighten restrictions on releases to foreign nationals who are in the United States? Because my instinct is that—my suspicion is that this is where most of the leakage is taking place. It isn’t necessarily in outright transfers to foreign subsidiaries. It’s investors, specialized advisors, engineering personnel, who are foreign nationals resident in the United States. We have provisions in place to address this. I’m just wondering, do you think that—do think that some sort of tightening legislatively in this area is in order right now? Thank you so much. CORNYN: Thank you. I think the—what we’re talking about is, I would say, a narrow slice of the pie. The export control regime, which I think works relatively well but it does not keep up with the cutting-edge technologies, that doesn’t deal with that in a way that I think we would like the CFIUS process to do. I have no doubt that there are counterintelligence activities occurring in the country by foreign nationals who are trying to steal our secrets, both for commercial use or for national security—or for military use, or national security purposes. And so I would say each of those functions operate in a complementary fashion to try to hopefully keep our nation safer. LEHR: Well, many thanks, Senator, for coming to join us today, share your insights. We really appreciate it. And I’m sure there are many in this room who would be happy to be a resource to you and your staff going forward as you work through the legislation.